The potential to burn off pounds of unwanted excess fat tissue is one major reason why people incorporate an exercise program in to their daily routine. There are plenty of programs, machines and various exercises that can aide in doing so, but what is the most efficient way to do so? This has been an ongoing debate for decades if not centuries, so who knows the correct answer? The best bet is to go by what the experts today say, because they have the newest and most cutting edge tools at their disposal. A high intensity interval training exercise routine currently is the best way to burn fat in the shortest period of time, for many reasons. 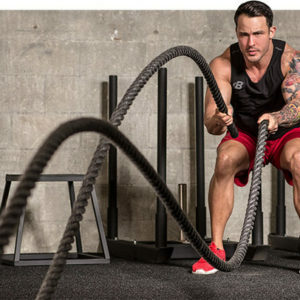 Arguably the most effective and efficient way to burn off extra fat is through a high intensity, interval training program. This program is one that utilizes a method of exerting a lot of energy and effort; followed by short periodic breaks. The idea behind this exercise program is to maximize the benefits seen within the shortest time frame. This is possible through variation of exercises preformed on a daily basis, as well as the intensity at which these exercises are performed. This also means that any user, at any fitness level can take advantage of said program. Whether you are an athlete that regularly competes in events or if you are a weekend warrior this program will work for you. One major reason why this routine works is that you do not allow your body to adjust; keeping your body in this continued state of stress will force the body to adapt to these changes. This means that if you are comfortable in doing your exercise routine, you aren’t maximizing your benefit and need to increase the intensity. This is why the program works for anyone, it doesn’t matter what fitness level you are to begin with, the program gradually increases the intensity at the user’s discretion. This allows someone who is a beginner to start slow and gradually work themselves up. Conversely it also allows a trained athlete to increase their performance as well, by pushing them to the very edge of their physical limitations. Another important key to succeeding in using this exercise routine in understanding how it affects one’s heart rate, VO2 max and oxygen consumption post workout. It is of absolute importance that the user elevates their heart rate to where they are working at 80-90% of their maximum heart rate if they wish to lose fat as quickly as possible. This is because doing so increases the users metabolism post workout, which requires more oxygen use, hence more energy expended. If the user adheres to and utilizes the benefits of the program correctly, they will be burning excess fat around the clock. Studies have shown that doing only 30 minutes of high intense exercise can increase the user’s metabolism for up to 24 hours, making it important that the user sticks consistently to the program’s daily routine. Various exercises can be incorporated in to an interval training program. The wide variety of exercises at the users disposal here also means that those with slight physical limitations can also take advantage of this type of exercise program as well. Some of these exercises include rowing, stationary bike, elliptical, treadmill, jumping rope, etc. This routine can also be done without the need for heavy equipment, eliminating the need for an expensive gym membership. The only real negative to a high intensity interval training program is the potential for injury. Since the user in theory will be training at near their maximum heart rate and overall ability, it is recommended that the user be fully alert and aware of their surroundings when partaking in these activities. It is also highly advised that the user stretch thoroughly prior to exercise and post exercise as well. Maintaining a healthy diet and maintaining a sufficient level of hydration will also help tremendously when it comes to succeeding in this program. This means drinking before, during and after the exercise as well. The body requires specific nutrients in order for it to repair and adapt in the most efficient manner, so diet is extremely important in maintaining success in this program.